There is no effective small-molecule therapy for most viruses, including highly pathogenic viruses such as Ebola, which is associated with mortality rates of up to 90 percent following infection. Filone et al, describe compounds that inhibit the replication of genetically diverse viruses, including Ebola. 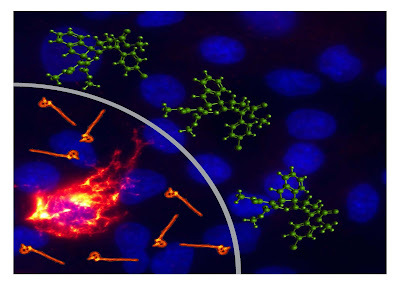 These compounds can limit virus replication (illustrated as green molecules "blocking" spread of orange Ebola virus virions from an infected cell). These molecules represent probes of a central virus function as well as a lead compound for the development of effective broad-spectrum antivirals. Credit: Image created by Claire Marie Filone and John Connor, Ebola virus micrograph by Chris Reed at USAMRIID. Researchers are studying molecules called indolie alkaloids that can be modified to enhance antiviral activity for a possible treatment for various viral infections such as the deadly Ebola virus. Viruses are small infectious agents that are made up of a chain of genetic DNA or RNA. Viruses needs a host cell to stay alive and replicate. The difference between bacteria and a virus is that a bacteria is a living single celled organism. A virus is not considered a living organism (there are some arguments for and against this). A virus does not have any cellular parts or internal cellular structure. It consists only of a protein coat that holds a coiled string of nucleic acid, in this case DNA or RNA. While bacteria can thrive in most surfaces and environments, a virus needs a living host to stay alive. It infects the cells of the host and uses these cells to make copies of it, infecting other cells in the process. Viruses spread from host to host through contact; direct or indirect. Antibiotics only treat bacterial infections. They address bacterial infections by killing off the bacteria. For viral infections, there are relatively few drugs that can address these. This is because the virus lives inside the cells. Destroying the virus means killing the cells of the host. Immunizing against a virus is the most common way. Immunization protects the body from contracting the viral infection. But as seen with the common cold or the influenza virus, viruses can mutate and work around the immunization. Illnesses caused by many of the world's most deadly viruses cannot be effectively treated with existing drugs or vaccines. A study published by Cell Press in the March 21 issue of the journal Chemistry & Biology has revealed several compounds that can inhibit multiple viruses, such as highly lethal Ebola virus, as well as pathogens responsible for rabies, mumps, and measles, opening up new therapeutic avenues for combating highly pathogenic viruses. "The medical field currently does not have ideal antiviral therapies, often no therapeutics at all, and the development of broad-spectrum antivirals is a great way to provide treatment in the future," says study author Claire Marie Filone of Boston University School of Medicine. "Toward that end, we have identified a drug that targets multiple viruses- and may be developed into an antiviral treatment for known and emerging viruses." Many viruses that cause human diseases are nonsegmented, negative-strand (NNS) RNA viruses, which include the highly lethal Ebola virus and other pathogens mentioned above. In contrast to the many antibiotics that work against a wide range of bacteria, there are currently no highly effective or safe broad-spectrum drug treatments for viral diseases. To address this need, John Connor and John Snyder of Boston University and their team screened thousands of diverse compounds for small molecules that showed strong antiviral activity against multiple NNS viruses. They identified several molecules that inhibited infection in cells exposed to either Ebola or another NNS virus called vesicular stomatitis virus. These molecules, which are related to a class of plant-derived compounds called indoline alkaloids, share a common chemical structure that can be modified to enhance antiviral activity. The most potent of these compounds turned off NNS viral genes by blocking transcription. "Because our antiviral targets such a critical step in virus replication, we may be able to develop it into a therapeutic that could be used against many different types of viral infections," Filone says.